While some recent commentators have suggested Americans stop worrying about our debt, evidence shows there is a significant upside to addressing our unsustainable fiscal situation. Recently, the Congressional Budget Office (CBO) estimated that restoring the debt-to-GDP ratio to its historic average in three decades could increase per-person income that year by $6,000, a 6.5 percent increase. Relying on pro-growth policies to fix the debt could increase income even further. As our readers know well, federal debt is currently at a post-war record level of 78 percent of GDP and under current law is headed to 152 percent of GDP by 2048. This high and rising debt has a number of negative consequences, including higher interest payments, reduced fiscal space, rising interest rates, and an increased risk of fiscal crisis. Rising debt also "crowds out" productive private investment, as investors divert an increasing share of their savings toward purchasing government bonds. By CBO's estimate, every $1 increase in deficits reduces private domestic investment by 15 to 50 cents and increases foreign holdings of American assets by another 20 to 25 cents. Both of these phenomena lead to slower income growth for American workers and investors. Fortunately, there is an upside – slowing the growth of debt can actually accelerate income growth. Under current law, CBO projects that real Gross National Product (GNP) per capita – a proxy for average income – will grow from $63,000 today to $92,000 (in 2019 dollars) by 2048. If policymakers simply stabilize the debt at today's high levels of 78 percent of GDP, CBO projects per-person income will rise to $96,000. That's a $4,000 (4.3 percent) increase in income per person, per year. If policymakers were able to gradually reduce the debt-to-GDP ratio to its historic average of 41 percent of GDP – as users can do with our Debt Fixer tool – CBO estimates per person income would increase to $98,000. That's $6,000 per person per year, a roughly 6.5 percent increase. 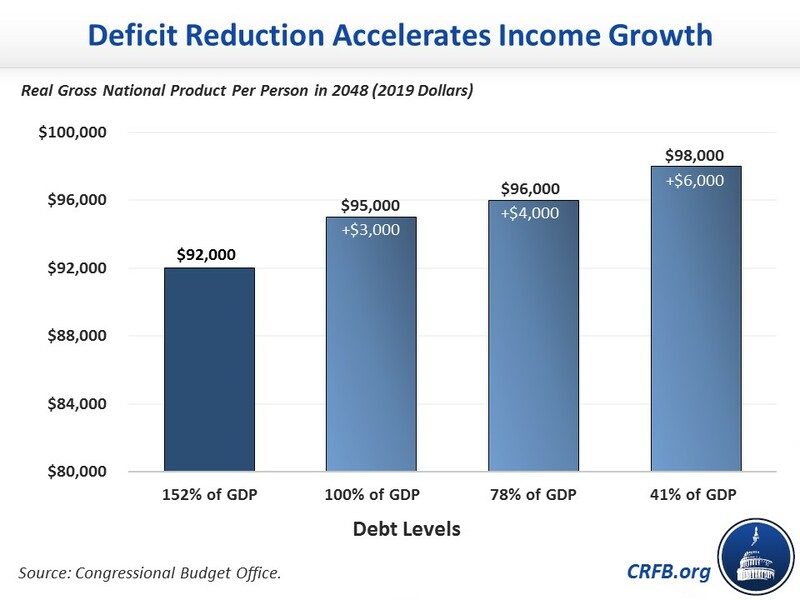 Actual growth from deficit reduction could be even greater if the deficit-reducing policies themselves are pro-growth. For example, changes to Social Security that encourage productive aging, reforms to the tax code that close distorting loopholes, improvements to welfare or disability programs which help people to return to work, or increases in (especially higher-skilled) immigration can all boost future incomes both by reducing deficits and promoting work or investment. While the economy has been growing rapidly, few economists or forecasters expect this rapid growth rate to last – certainly not on its own. Policymakers who want to ensure strong income gains along with further economic growth should work on putting the debt on a downward sustainable path. Doing so would not only avoid the downside risks of high debt but also improve Americans' standard of living.